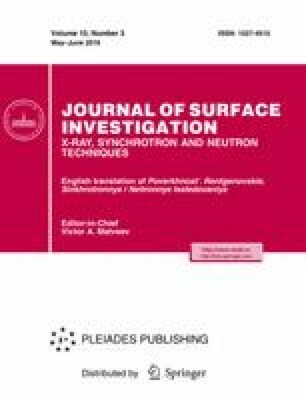 The formation of nanoparticles containing zinc in Si(001) substrates by the implantation of 64Zn+ ions and subsequent annealing in dry oxygen at 800 and 1000°C for 1 h is studied. The structure of the samples is studied by high-resolution transmission electron microscopy, X-ray diffraction, and photoluminescence spectroscopy. 20-nm zinc nanoparticles located at a depth of about 50 nm are revealed in the as-implanted sample. 10–20-nm pores are observed in the surface layer. Annealing leads to oxidation of the Zn nanoparticles to the Zn2SiO4 state. It is shown that the oxidation of Zn nanoparticles begins on their surface and at an annealing temperature of 800°C results in the formation of nanoparticles with the “соre–shell” structure. The X-ray diffraction technique shows simultaneously two Zn and Zn2SiO4 phases. ZnO nanoparticles are not formed under the given implantation and annealing conditions. Original Russian Text © K.B. Eidelman, K.D. Shcherbachev, N.Yu. Tabachkova, V.V. Privezentsev, 2016, published in Poverkhnost’. Rentgenovskie, Sinkhrotronnye i Neitronnye Issledovaniya, 2016, No. 6, pp. 31–36.